The rehearsal day for the montage launching. For more pictures, browse our flickr set here. 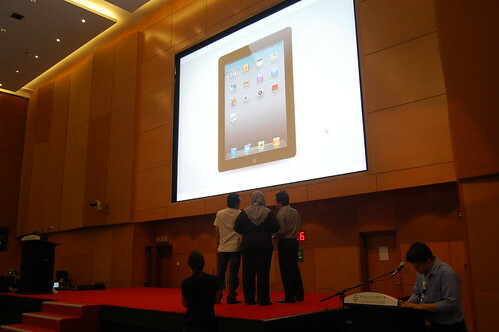 This is a last minute project, awarded by the PDB for the Technology Showcase 2011. We only have less than 1 week to produce a 1 minute montage for the launching event. Luckily the branding for the event has been produced by another vendor thus this has cut short a lot of process. Using the same element and concept, we make it live, and animated. We just deliver the 2 minute montage for the Showcase Wariseni 2010 that was held at Legend Hotel a few week ago. Although there was a few challenge towards delivering this job, Azrai Fahmi as the main lead for Secretlab has made it tremendously success.